Here’s the last instalment of the bread series (for now)! I used some of my previous batch of TangZhong dough to turn them into pork floss buns. I think it was BreadTalk who first came up with this bun and it was an instant hit. 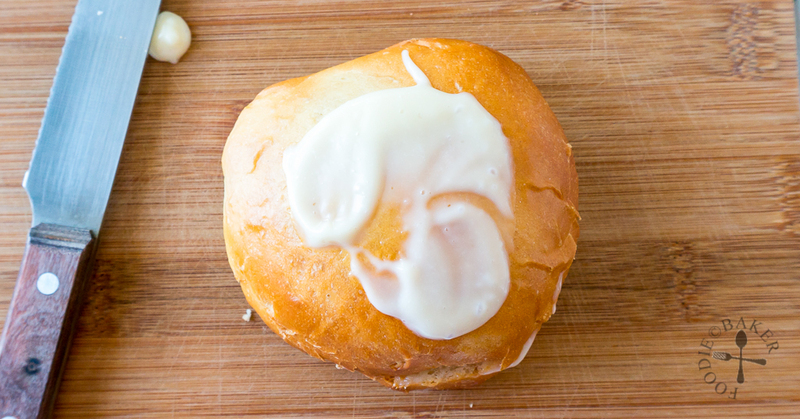 Many bakeries also came up with their own version of this bun within a span of few months. However I have not eaten them for a long time because the prices kept increasing. But because I was never good at making bread, I’ve never thought of recreating them at home, until now! 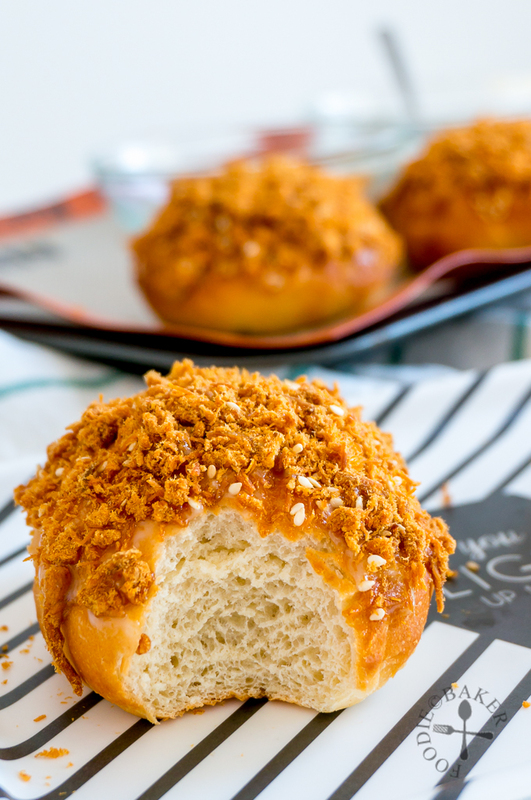 For those who never seen or heard of pork floss buns before, it’s actually a combination of a soft and fluffy bun, with a creamy and sweetened mayo filling and topped with savoury pork floss. Pork floss is a dried meat product popular in Asia. It is made by stewing pork pieces in a braising sauce until the pork is soft enough to pull into pieces with a fork (somewhat like pulled pork). The meat is then strained and dry-cooked in a large wok until it is dry. I’ve seen recipes of pork floss online but I’m not sure if I will be making them anytime soon… it’s really quite tedious! 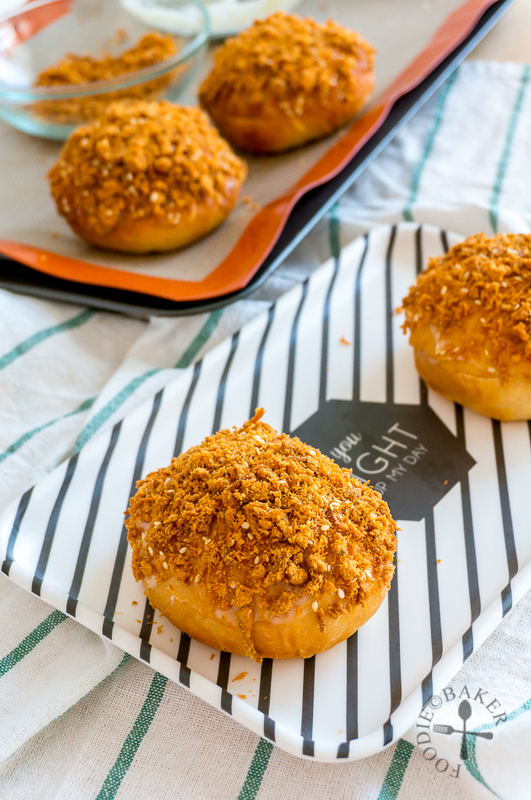 Pork floss is incredibly versatile – it is used as a topping for congee, tofu, pineapple fried rice or used as a filling in buns or it can be a snack on its own! Pork floss usually comes in 2 forms, soft and crispy. 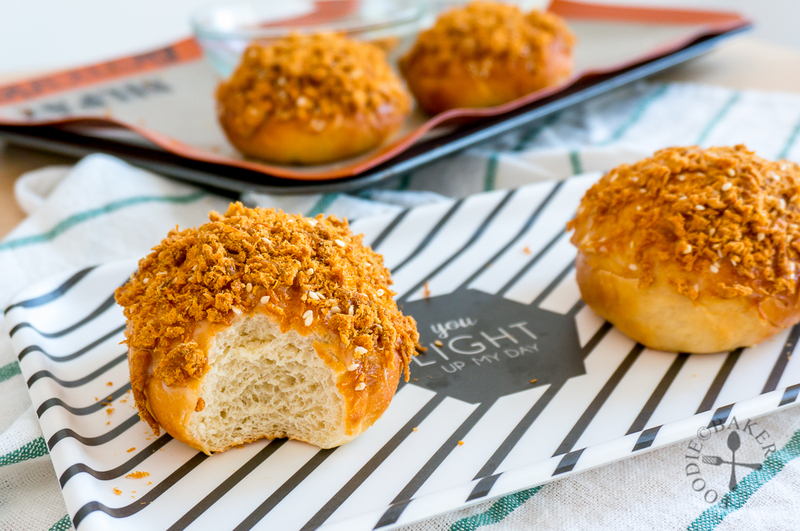 The soft one is actually more suitable for making these pork floss buns but I only brought back the crispy one with me so I had to make do. Brush the top with milk or egg wash for a glossy finish. Combine mayonnaise and honey together. 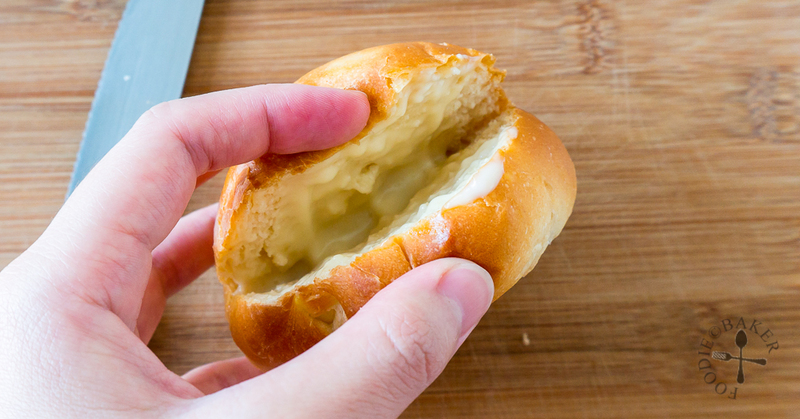 Cut a slit in the buns and fill with some honey-mayo. Spread more honey-mayo on top! Then dip away in the pork floss! Click to see the full-size step-by-step photos in a slideshow! Inactive time: 3 hours of dough-rising not included. Combine bread flour and water/milk in a small pot. Cook over medium heat, stirring constantly, until it has a pudding-like consistency. Butter or oil a large mixing bowl, set aside. Place milk, egg, TangZhong, bread flour, caster sugar, milk powder and salt in another clean and dry mixing bowl. Fit the mixer with a dough hook and run on low (Speed 1 on Kenwood Chef Sense) until a loose dough is formed. Add in the yeast and knead until a dough is formed, scrapping down the sides if necessary. Add in the unsalted butter and knead for 15 minutes until the dough is soft and no longer sticky. Lightly dust the table top with bread flour. Transfer the dough onto the floured table top and knead by hand for another 5 minutes, dusting with more flour if needed (but not too much). Pinch a piece of dough a test if it's ready - the dough is ready when it can be stretched into a thin membrane and a hole poked in the center is smooth and not an irregular tear-off. Lightly dust the table top with bread flour again. Turn the dough out again onto the floured table top and knead for 2 minutes. 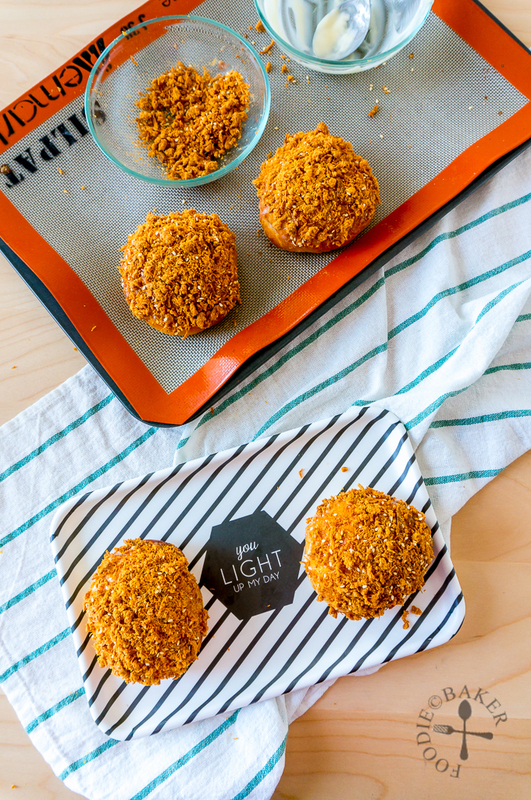 Divide the dough into 80-gram balls (you will get about 8 to 9 balls) and roll each piece of dough into a ball. Flatten slightly and place on a baking sheet. Cover with a tea towel or plastic wrap and let rise for 1 hour. Preheat oven to 180C / 355F (not fan-assisted). Brush the top with milk (you can use egg or cream). Bake for 20 to 25 minutes until the top is golden-brown. 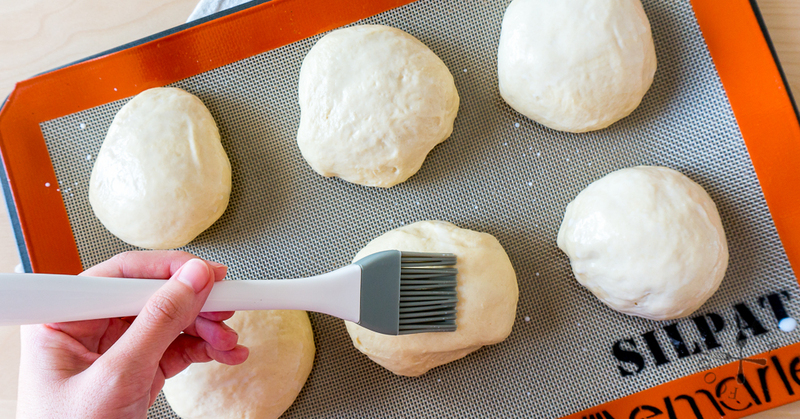 Remove the buns from the oven and set on a wire rack to cool before using. 1) For first-timers: If this is the first time you are making the bread, add only 80 grams of milk instead of 125 grams. This is because different brands of bread flour absorbs liquid differently. Add more milk after mixing in the butter if the dough is dry. 2) Scalding the milk: Heat the milk to a simmer, stirring frequently to prevent a skin from forming on the top, then let cool until it's warm or at room temperature before using. Some milk has a type of protein which inhibits yeast rise. Hence it's best to heat the milk to denature (sort of kill) the protein before using. 3) Overnight: You can let the dough proof overnight in the refrigerator. Just wrap the bowl with a clingwrap and stash it in the refrigerator. 4) The bread is best on the day it's made, but you can bake the bread up to a day in advance before using. 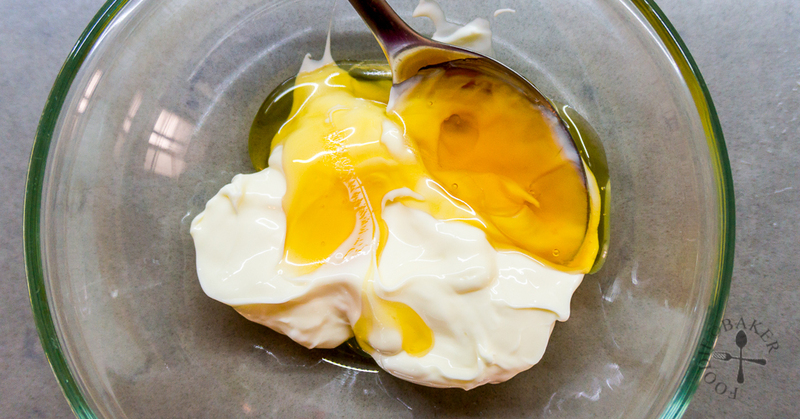 Whisk mayonnaise and honey together in a shallow bowl. Stir pork floss and sesame seeds together in a separate shallow bowl. Once the bread has cooled completely, cut each bread lengthwise with a bread knife but don't cut all the way through. Fill it with a little honey-mayo, then spread the top of the bread with more honey-mayo. Dip the top of the bread into the pork floss, pressing gently so that the pork floss adhere to the bread. 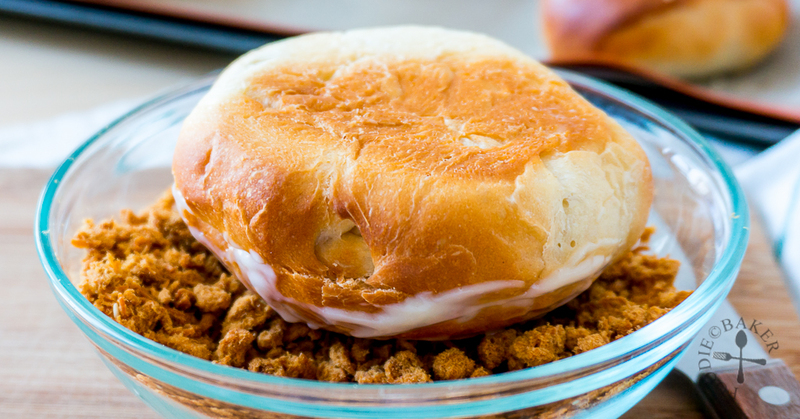 Serve the bread immediately, or store in an airtight container in the refrigerator for up to 3 days. Let the cold bread come to room temperature before serving. I doubt I’d ever prepare these buns, Jasline, but I sure would like to try one. I’m going to Chinatown this weekend and maybe, if I’m lucky, I can find a place that features breads and sweets. Wouldn’t that be something, eh? Seriously, these are amazing! What a great job! !